JAMMU, July 27: All Parties Migrants Coordination Committee (APMCC) today came down heavily on the Director School Education Kashmir (DSEK) for his order asking migrant employees to resume their duties within a week or face termination even as the Chief Minister and the Chief Secretary has assured them that they won’t be forced to join till their security concerns are addressed. The protesters accused the local administration of running a parallel Government in Kashmir. Hundreds of migrant employees staged a massive demonstration outside Relief and Rehabilitation Commissi-oner’s Office to register their protest against the unilateral decision of the DSEK without giving any security guarantee even as the APMCC had recently written to Prime Minister, Home Minister, Governor and Chief Minister seeking guarantee of security and safety before asking the employees to return. 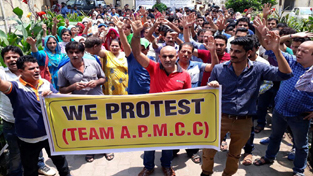 The employees led by APMCC chairman Vinod Pandit and King C Bharati, senior journalist and national spokesperson APMCC asked the Relief Commissioner to communicate their concerns to the concerned authorities threatening mass resignations and street protest against the biased attitude of the Valley administration towards these victims of terror. The leaders also condemned the Information Department for using derogatory words against the employees in yesterday’s press note and asked the Chief Minister the concerned minister to take strict action against the erring officials who used word truant against these victims of terror. Speaking on the occasion Vinod Pandit said that local administration was flouting the orders of the Chief Minister, Chief Secretary and the Divisional Commissioner Kashmir who have categorically assured them that they won’t be forced to join till their security concerns are addressed and they will be taken into confidence in every matter. King C Bharati said that the mind-set of the local administration can be gauged from the fact that Information Department used a derogatory word like truant employees against the community that has suffered the onslaught of terrorism adding they have been employed as a CBM and rehabilitation package being the victims of terror and not as regular employees who were playing truant. The Relief Commissioner who met the agitating employees assured them that their concerns would be taken up with the DSEK and other authorities adding their representation has already been despatched to PMO, HM, Governor and the Chief Minister. Employees who addressed the gathering include Rajan Kumar, Vinod Kumar, Ajay Kumar, Kamal Kumar, Sarita, Manita, Sunil Kumar, Sameer Ji, Anil.